Several of us gals helped pull together a baby shower for our friend Kim to welcome baby Kennedy. Lots of love was poured into her theme, “Bun in the Oven,” partially because how great of a friend Kim is and partially because we’re all vouching for our sons since Kennedy is one of the few girls born amongst many boy babies recently. We started with some custom invitations, which are now available in my Etsy store. It made perfect sense to use pastry bag envelopes to go with the baking theme, so after sending a few testers through the mail, the invite was tucked in a glassine bag and completed with matching address labels and sewn shut. We chose a red and gray modern theme to match the swanky location at Hotel Indigo. Red cutlery and a napkin were tucked away in more pastry bags which the guests used to take home cinnabuns afterward. And what 2012 party is complete without stripey straws and chevron, LOL? The centerpieces included chevron fabric and framed photos including matching subway art. The posters each had a bible scripture highlighting the word aBUNdance somehow, celebrating the birth of baby Kennedy. These make a perfect freebie printable so scroll down to the bottom of this post to download your own aBUNdance posters! Shower activities included “Recipes of Love” advice cards that guests left in a recipe box for the mom-to-be. We also had a “Meal Tree” suspended between two mug tree towers with bakers twine. Different dinner ideas hung from the line and interested guests took a card and left their contact info so that someone could coordinate meals for the family once baby arrived. To make the room pop, we filled giant round balloons and put one on each table, anchored down with gray crepe paper fringe. Of course Kennedy was showered with plenty of frilly pretties–remember, the majority of our friends are having boys so we all had to shop for our lace and ruffles somehow! So happy for Baby Kennedy–I hope she remembers that I would throw her fabulous parties as her future mother-in-law! Now enjoy your own printable aBUNdance scripture posters! 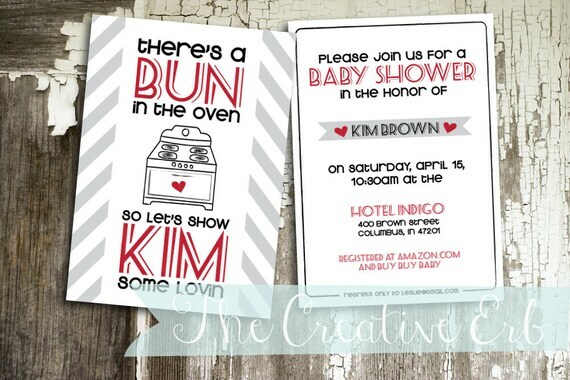 Custom Bun in the Oven Invitations Now Available! Guess what? You can order your own Bun in the Oven party invitations like the ones above on my Etsy Store.